So I finally get round to writing this little adventure in. Im having to cast my mind back as believe it or not it was a month ago that we hit the big city! It is a place I LOVE. Think im destined to live here at some point as really fell in love with the place. We caught an overnight greyhound bus for 12 hrs from Byron, and it being one of the longest journeys it was obviously one of the most packed! After moving from my original seat that had rain pouring on it from the leaking window (remember it only rained in Byron), i did manage to move and get 2 seats to myself on a broken chair. By this point i wasnt bothered and with the ability to contort my body into awkward shapes i was able to make myself comfy and get a few hrs sleep. We checked into a hostel, blagging cheap rates and stayed there for 6 nights. Was the nicest place we stayed at, v.secure, clean rooms, bathrooms etc. We had a bit of a nap and then a wander when we first got there. Found out we were really centrally located with about a 20 min walk to Sydney harbour and 10 to Darling. That first night we decided we'd be a little sociable and go for an easy drink to unwind. There was a bar in the basement floor of the hostel with one pound beers. We tried and liked (not sure whether it was the beer or the price we like initially!) We then had an american guy start chatting to us and then an aussie brother and sister. All at first seemed pretty normal, got a few rounds in etc etc! We soon got roped in to hitting a few other bars with Americano et al. He got wasted and started dribbling, the aussie guy was such a jock and only spoke out one corner of his mouth, except he'd alternate which side (v.strange) and the girl soon started hitting on anything that moved (and i mean anything!). By that point we were in a hotel bar with some sort of disco on. Amy and i swiftly moved to the other side of the bar when no one was looking and found better company in a group of aussie footballers. Far better company!!! Americano disappeared (i presume drunkenly) oz chick realised her luck was out and went looking elsewhere and we finally managed to lose strange talking bro in Maccy d's at 4am! All in all a very funny night. Amy then wanted a kebab and managed to sample everything behind the counter. Half of it was found in her bag the next morning....!!! We spent the next day sightseeing and went up the sky tower to spectacular views. That day we also took a ferry across the harbour and got a few snap shots. We went to the aquarium and did all the famous sights including walking over the harbour bridge. It really was pretty cool. Got a bit of shopping in and went round the markets. Met up with one of my cousin Raes friends and spent a night out with Bree whaich was cool. We spend more days sight seeing and i did the botanical gardens at sunset getting some incredible pictures. Just call me david bellamy! I then got locked in and had to find a park ranger to let me out. This was after fruit bats had swooped down at me and squalking cockatoos was hurtling my way (I hate birds at the best of times!) Which reminds me, Amy did have her lunch snatched out of her hands at the harbour front. I was already half a mile running by this point! Pretty amusing, you probably had to be there! We spent a day at bondi and did a cliff top walk ariound some amazing bays. Was pretty cool watching the surfers too. 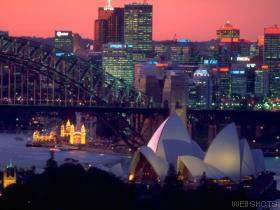 Sydney had an aura about it that had culture and vibrance, but far far more relaxed than anything back home. Oh and its actually hot in the summer! My kinda place!